Bluegrass Turmash is a High Fibre, High Oil, Cereal Free, Conditioning Mash. Containing Turmeric Promoting Anti-inflammatory Properties and Quick soaking within 20 minutes. 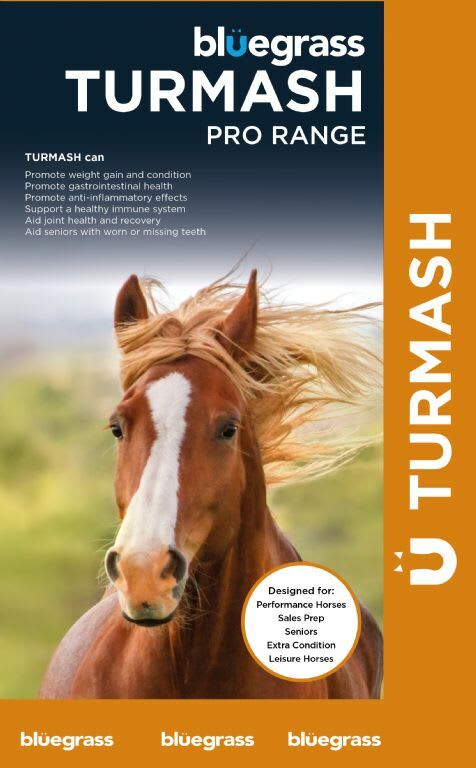 Bluegrass Turmash is a fully balanced conditioning mash, fortified with high quality vitamins and minerals and the high fibre content promotes a helathy gastrointestinal tract. Turmash is a non-heating feed with slow release energy sources from "super fibres" and oil. Fortified in turmeric known for its anti-inflammatory and anti-oxidant properties, turmeric has been recommended for horses suffering from laminitis and osteoarthritis. Bluegrass Turmash contains linseed, a naturally high source of omega 3, to help promote joint health, glossy coat and condition.